Cliffords Taxidermy~What’s On Your Wall? Whitetail wall pedestal deer mount above and beyond a normal deer head mount. Serving Central New York for over 20 years! We here at Cliffords Taxidermy accept all small game and with some big game species for taxidermy. 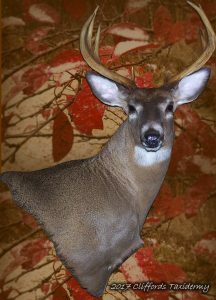 The most popular and most requested game animal Cliffords Taxidermy gets in to mount is by far the whitetail deer. Other popular game animals here in our shop are squirrel’s, coyote, fox, mink and upland game birds. Waterfowl season here in Otsego County starts with early geese season opening in early September and followed by duck season in October. We are licensed to mount waterfowl. Call us today and get stuffed! Good News! We mount all game including birds and fish! So bring us your trophy today and see what we can do for you. When it all comes together, look for a way to preserve that experience. Relive that memory by trusting Clifford the taxidermist.